THE MODERN IMAGE of heaven—clouds, harps, and a perpetual Sunday service-is hardly inspiring. Even hell sounds like an improvement. It may be fiery and dark, but interesting people live there, and at least the demons have some fun. Such views would have seemed ludicrous to Christians in Dante’s day. Dante and his contemporaries had inherited rich images of heaven and hell from the Bible, early Christian writings, and the great imaginations of the Middle Ages. These shifting images reflect both the enormous range of human creativity and our ultimate inability to grasp what only God understands. The Bible mentions heaven frequently and hell rarely. Both are depicted as places with physical characteristics but also as conditions: heaven is a state of being eternally with God in unending love for him and for our neighbors, while hell is a state of being eternally separated from God and neighbor, owing to a person’s refusal to accept love. The Old Testament focuses on the covenant (contract) between the Lord and the community: the people of Israel. For the Hebrews, salvation involved the whole community, not just the individual. As an extension of this community experience, the Hebrews identified heaven with the City of Jerusalem. The prophet Zechariah proclaimed that Jerusalem was the center of Israel now and in the future: “This is what the Lord says: ‘I will return to Zion and dwell in Jerusalem’ “ (Zech. 8:3). There the resurrection and judgment will take place, and the Messiah will bring the Kingdom of God to earth with the return of the people of Israel to the Promised Land. The New Testament epistles and gospels say little about the celestial realm. The Book of Revelation contains the most descriptive treatment of heaven, revealing that the world will be renewed: “Then I saw a new heaven and a new earth, for the first heaven and the first earth had passed away. . . . I saw the Holy City, the new Jerusalem, coming down out of heaven from God, prepared as a bride beautifully dressed for her husband” (Rev. 21:1–2). "The city was laid out like a square, as long as it was wide. [The angel] measured the city with the rod and found it to be 12,000 stadia in length, and as wide and high as it is long. He measured its wall and it was 144 cubits thick, by man’s measurement, which the angel was using. The wall was made of jasper, and the city of pure gold, as pure as glass. The foundations of the city walls were decorated with every kind of precious stone. The first foundation was jasper, the second sapphire, the third chalcedony, the fourth emerald, the fifth sardonyx, the sixth carnelian, the seventh chrysolite, the eighth beryl, the ninth topaz, the tenth chrysophase, the eleventh jacinth, and the twelfth amethyst. The twelve gates were twelve pearls, each gate made of a single pearl. The great street of the city was of pure gold, like transparent glass” (Rev. 21:16–21). The New Testament gives no such detailed description of hell, though Jesus says that at the final judgment his father will tell the unrighteous, “Depart from me, you who are cursed, into the eternal fire prepared for the devil and his angels” (Matt. 25:41). Jesus also describes hell as “the darkness, where there will be weeping and gnashing of teeth” (Matt. 25:30) and, quoting Isaiah, as the place where “their worm does not die, and the fire is not quenched” (Mark 9:48). Revelation adds a few more vivid descriptions of unrepentant sinners’ agony. An angel says of those who receive the beast’s mark, “the smoke of their torment rises for ever and ever,” and they have no rest day or night (Rev. 14:11). Later in the book, death and Hades are “thrown into the lake of fire,” which is “the second death” (Rev. 20:14). Of all the early Christian writers and philosophers who expanded the concept of heaven, the most important was Irenaeus (c. 130–200), a bishop, theologian, and opponent of heresies. He summed up the tradition of heaven as it was in his time: Paradise is the beginning, heaven the end. Humanity was created in paradise without flaw but fell through its own deliberate sin; humanity redeemed by Christ is in heaven without flaw. All the blessed in heaven will see Christ, the glory of the communion of saints, and the renovation of the world. They will dwell in their true home, where with Christ they enjoy eternal peace and comfort. Hell plays only a minor part in the writing of the orthodox Christian writers. Early Christian apocalyptic literature, however, which was often unorthodox, greatly amplified and popularized the more vivid aspects of Matthew and Revelation. Dante was almost certainly familiar with this work. The most influential theologian of all time, Augustine of Hippo (354–430), expressed his ideas of heaven most fully in his greatest work, City of God. He develops the ideas of Paul and John the Evangelist, contrasting the Kingdom of God with the Kingdom of This World. Augustine’s heaven is a free and unshakable embrace. Ever here, ever open to those who long for it, heaven is the enjoyment of God and of our fellow lovers of Christ by the whole human person, body and soul. Each of the blessed retains his or her own personality, distinct from God and from others. More important, though, salvation incorporates the whole community of those who love God. That was as close as Drythelm got to innermost heaven before he was obliged, like Dante, to begin his return to earth. Dante communicates a similar idea with his heavenly rose. An angel explains that the tree is the church and that the men and women under its branches are builders and defenders of churches. As with Drythelm before and Dante afterward, the vision ends before Tondal can see God himself. This sort of dire medieval vision set the tone for Dante’s Inferno, whereas medieval theology set the tone for Paradiso. In the twelfth and thirteenth centuries, scholastic theologians, usually university professors, applied rational philosophy to traditional doctrine. Scholasticism culminated at the University of Paris in the brilliant, detailed philosophy of Thomas Aquinas (1225–1274). According to the scholastics, our salvation or blessedness—our complete fulfillment, where each person realizes his or her complete potential—cannot consist of any created good, but only of the universal good, which is God. Yet Aquinas and most scholastics argued against the idea that in heaven we are dissolved in or merged with God. Rather, we enjoy the beatific vision, which means seeing, understanding, and loving God and his creatures in peace and harmony and with dynamic and growing intensity. The beatific vision is based in the New Testament: “We shall see him as he is” (1 John 3:2), and “Anyone who has seen me has seen the Father. How can you say, ‘Show us the Father'? Don’t you believe that I am in the Father, and that the Father is in me?” (John 14:9–10). The scholastics attempted a complete, coherent view of the cosmos through philosophy, as Dante did through poetry. But unlike Dante, the scholastics showed little interest in concrete imagery. For Aquinas, heaven consisted of perfect vision and the satisfaction of all desires, especially desires for delight, honors, knowledge, and security. He writes in the twelfth article of his catechism, “In heaven there will be the happy society of all the blessed, and this society will be especially delightful.” He makes no further attempt to describe it. The scholastics gave scant attention to imagery because they were primarily interested in the moral, not the physical, cosmos. For them, knowledge of the material world yielded only inferior truth that pointed to the greater truth—theological, moral, and even divine. Jeffrey Burton Russell is professor emeritus of history at the University of California, Santa Barbara, and author of 17 books including A History of Heaven and The Devil: Perceptions of Evil from Antiquity to Primitive Christianity. Star sightings in the Comedy highlight Dante’s religious and political views. Why Dante’s medieval masterwork continues to thrive in translation. 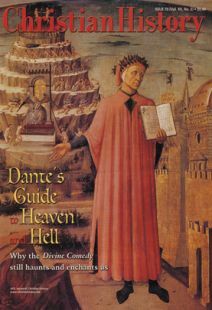 Resources for further study of Dante and his works. Reforming doctrine was just the beginning of a vigorous campaign to restructure Christian life—at church, at home, and in each believer’s heart.